Every now and then, someone recommends me to take a look at a flashcard app. It’s often interesting to see what developers have done with design, gamification and UX features, but the content is almost invariably awful. Most recently, I was encouraged to look at Word Pash. The screenshots below are from their promotional video. According to the website, ‘WordPash is a free-to-play mobile app game for everyone in the global audience whether you are a 3rd grader or PhD, wordbuff or a student studying for their SATs, foreign student or international business person, you will become addicted to this fast paced word game’. On the basis of the promotional video, the app couldn’t be less appropriate for English language learners. It seems unlikely that it would help anyone improve their ACT or SAT test scores. The suggestion that the vocabulary development needs of 9-year-olds and doctoral students are comparable is pure chutzpah. The deliberate study of more or less random words may be entertaining, but it’s unlikely to lead to very much in practical terms. For general purposes, the deliberate learning of the highest frequency words, up to about a frequency ranking of #7500, makes sense, because there’s a reasonably high probability that you’ll come across these items again before you’ve forgotten them. Beyond that frequency level, the value of the acquisition of an additional 1000 words tails off very quickly. Adding 1000 words from frequency ranking #8000 to #9000 is likely to result in an increase in lexical understanding of general purpose texts of about 0.2%. When we get to frequency ranks #19,000 to #20,000, the gain in understanding decreases to 0.01%. In other words, deliberate vocabulary learning needs to be targeted. The data is relatively recent, but the principle goes back to at least the middle of the last century when Michael West argued that a principled approach to vocabulary development should be driven by a comparison of the usefulness of a word and its ‘learning cost’. Three hundred years before that, Comenius had articulated something very similar: ‘in compiling vocabularies, my […] concern was to select the words in most frequent use’. I’ll return to ‘general purposes’ later in this post, but, for now, we should remember that very few language learners actually study a language for general purposes. Globally, the vast majority of English language learners study English in an academic (school) context and their immediate needs are usually exam-specific. For them, general purpose frequency lists are unlikely to be adequate. If they are studying with a coursebook and are going to be tested on the lexical content of that book, they will need to use the wordlist that matches the book. Increasingly, publishers make such lists available and content producers for vocabulary apps like Quizlet and Memrise often use them. Many examinations, both national and international, also have accompanying wordlists. Examples of such lists produced by examination boards include the Cambridge English young learners’ exams (Starters, Movers and Flyers) and Cambridge English Preliminary. Other exams do not have official word lists, but reasonably reliable lists have been produced by third parties. Examples include Cambridge First, IELTS and SAT. There are, in addition, well-researched wordlists for academic English, including the Academic Word List (AWL) and the Academic Vocabulary List (AVL). All of these make sensible starting points for deliberate vocabulary learning. Sorell, C. J. 2013. A study of issues and techniques for creating core vocabulary lists for English as an International Language. Doctoral thesis. But, back to ‘general purposes’ …. Frequency lists are the obvious starting point for preparing a wordlist for deliberate learning, but they are very problematic. Frequency rankings depend on the corpus on which they are based and, since these are different, rankings vary from one list to another. Even drawing on just one corpus, rankings can be a little strange. In the British National Corpus, for example, ‘May’ (the month) is about twice as frequent as ‘August’, but we would be foolish to infer from this that the learning of ‘May’ should be prioritised over the learning of ‘August’. An even more striking example from the same corpus is the fact that ‘he’ is about twice as frequent as ‘she’: should, therefore, ‘he’ be learnt before ‘she’? List compilers have to make a number of judgement calls in their work. There is not space here to consider these in detail, but two particularly tricky questions concerning the way that words are chosen may be mentioned: Is a verb like ‘list’, with two different and unrelated meanings, one word or two? Should inflected forms be considered as separate words? The judgements are not usually informed by considerations of learners’ needs. Learners will probably best approach vocabulary development by building their store of word senses: attempting to learn all the meanings and related forms of any given word is unlikely to be either useful or successful. Frequency lists, in other words, are not statements of scientific ‘fact’: they are interpretative documents. They have been compiled for descriptive purposes, not as ways of structuring vocabulary learning, and it cannot be assumed they will necessarily be appropriate for a purpose for which they were not designed. A further major problem concerns the corpus on which the frequency list is based. Large databases, such as the British National Corpus or the Corpus of Contemporary American English, are collections of language used by native speakers in certain parts of the world, usually of a restricted social class. As such, they are of relatively little value to learners who will be using English in contexts that are not covered by the corpus. A context where English is a lingua franca is one such example. A different kind of corpus is the Cambridge Learner Corpus (CLC), a collection of exam scripts produced by candidates in Cambridge exams. This has led to the development of the English Vocabulary Profile (EVP) , where word senses are tagged as corresponding to particular levels in the Common European Framework scale. At first glance, this looks like a good alternative to frequency lists based on native-speaker corpora. But closer consideration reveals many problems. The design of examination tasks inevitably results in the production of language of a very different kind from that produced in other contexts. Many high frequency words simply do not appear in the CLC because it is unlikely that a candidate would use them in an exam. Other items are very frequent in this corpus just because they are likely to be produced in examination tasks. Unsurprisingly, frequency rankings in EVP do not correlate very well with frequency rankings from other corpora. The EVP, then, like other frequency lists, can only serve, at best, as a rough guide for the drawing up of target item vocabulary lists in general purpose apps or coursebooks. There is no easy solution to the problems involved in devising suitable lexical content for the ‘global audience’. Tagging words to levels (i.e. grouping them into frequency bands) will always be problematic, unless very specific user groups are identified. Writers, like myself, of general purpose English language teaching materials are justifiably irritated by some publishers’ insistence on allocating words to levels with numerical values. The policy, taken to extremes (as is increasingly the case), has little to recommend it in linguistic terms. But it’s still a whole lot better than the aleatory content of apps like Word Pash. See Kelly, L.G. 1969. 25 Centuries of Language Teaching. (Rowley, Mass. : Rowley House) p.206 for a discussion of West’s ideas. See Timmis, I. 2015. Corpus Linguistics for ELT (Abingdon: Routledge) for practical advice on doing this. In December last year, I posted a wish list for vocabulary (flashcard) apps. At the time, I hadn’t read a couple of key research texts on the subject. It’s time for an update. First off, there’s an article called ‘Intentional Vocabulary Learning Using Digital Flashcards’ by Hsiu-Ting Hung. It’s available online here. Given the lack of empirical research into the use of digital flashcards, it’s an important article and well worth a read. Its basic conclusion is that digital flashcards are more effective as a learning tool than printed word lists. No great surprises there, but of more interest, perhaps, are the recommendations that (1) ‘students should be educated about the effective use of flashcards (e.g. the amount and timing of practice), and this can be implemented through explicit strategy instruction in regular language courses or additional study skills workshops ‘ (Hung, 2015: 111), and (2) that digital flashcards can be usefully ‘repurposed for collaborative learning tasks’ (Hung, ibid.). However, what really grabbed my attention was an article by Tatsuya Nakata. 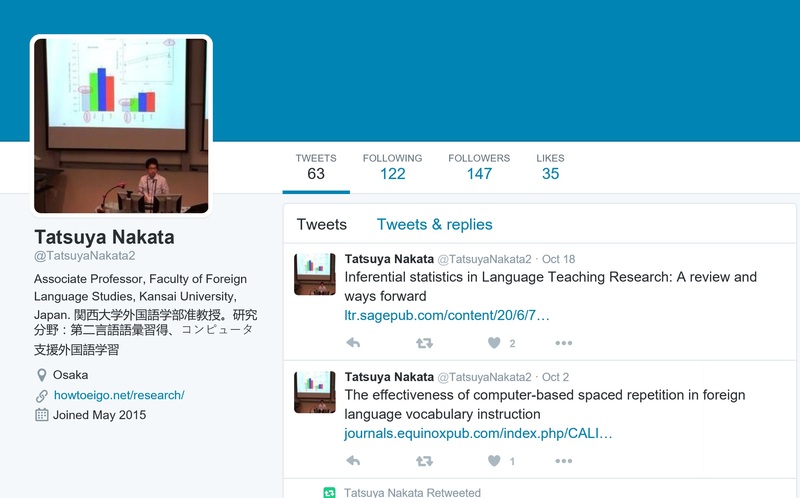 Nakata’s research is of particular interest to anyone interested in vocabulary learning, but especially so to those with an interest in digital possibilities. A number of his research articles can be freely accessed via his page at ResearchGate, but the one I am interested in is called ‘Computer-assisted second language vocabulary learning in a paired-associate paradigm: a critical investigation of flashcard software’. Don’t let the title put you off. It’s a review of a pile of web-based flashcard programs: since the article is already five years old, many of the programs have either changed or disappeared, but the critical approach he takes is more or less as valid now as it was then (whether we’re talking about web-based stuff or apps). Nakata divides his evaluation for criteria into two broad groups. (1) Flashcard creation: Can learners create their own ﬂashcards? (2) Multilingual support: Can the target words and their translations be created in any language? (3) Multi-word units: Can ﬂashcards be created for multi-word units as well as single words? (4) Types of information: Can various kinds of information be added to ﬂashcards besides the word meanings (e.g. parts of speech, contexts, or audios)? (5) Support for data entry: Does the software support data entry by automatically supplying information about lexical items such as meaning, parts of speech, contexts, or frequency information from an internal database or external resources? (6) Flashcard set: Does the software allow learners to create their own sets of ﬂashcards? (1) Presentation mode: Does the software have a presentation mode, where new items are introduced and learners familiarise themselves with them? (2) Retrieval mode: Does the software have a retrieval mode, which asks learners to recall or choose the L2 word form or its meaning? (3) Receptive recall: Does the software ask learners to produce the meanings of target words? (4) Receptive recognition: Does the software ask learners to choose the meanings of target words? (5) Productive recall: Does the software ask learners to produce the target word forms corresponding to the meanings provided? (6) Productive recognition: Does the software ask learners to choose the target word forms corresponding to the meanings provided? (7) Increasing retrieval eﬀort: For a given item, does the software arrange exercises in the order of increasing diﬃculty? (8) Generative use: Does the software encourage generative use of words, where learners encounter or use previously met words in novel contexts? (9) Block size: Can the number of words studied in one learning session be controlled and altered? (10) Adaptive sequencing: Does the software change the sequencing of items based on learners’ previous performance on individual items? It’s a rather different list from my own (there’s nothing I would disagree with here), because mine is more general and his is exclusively oriented towards learning principles. Nakata makes the point towards the end of the article that it would ‘be useful to investigate learners’ reactions to computer-based ﬂashcards to examine whether they accept ﬂashcard programs developed according to learning principles’ (p. 34). It’s far from clear, he points out, that conformity to learning principles are at the top of learners’ agendas. More than just users’ feelings about computer-based flashcards in general, a key concern will be the fact that there are ‘large individual differences in learners’ perceptions of [any flashcard] program’ (Nakata, N. 2008. ‘English vocabulary learning with word lists, word cards and computers: implications from cognitive psychology research for optimal spaced learning’ ReCALL 20(1), p. 18). I was trying to make a similar point in another post about motivation and vocabulary apps. In the end, as with any language learning material, research-driven language learning principles can only take us so far. User experience is a far more difficult creature to pin down or to make generalisations about. A user’s reaction to graphics, gamification, uploading time and so on are so powerful and so subjective that learning principles will inevitably play second fiddle. That’s not to say, of course, that Nakata’s questions are not important: it’s merely to wonder whether the bigger question is truly answerable. Nakata’s research identifies plenty of room for improvement in digital flashcards, and although the article is now quite old, not a lot had changed. Key areas to work on are (1) the provision of generative use of target words, (2) the need to increase retrieval effort, (3) the automatic provision of information about meaning, parts of speech, or contexts (in order to facilitate flashcard creation), and (4) the automatic generation of multiple-choice distractors. In the conclusion of his study, he identifies one flashcard program which is better than all the others. Unsurprisingly, five years down the line, the software he identifies is no longer free, others have changed more rapidly in the intervening period, and who knows will be out in front next week?